Jesse Bushyhead was a detachment leader during the forced Indian removal on what has become known as the Trail of Tears. In this capacity, he was responsible for the safe conduct of more than 900 emigrants from Tennessee to Indian Territory in eastern Oklahoma. 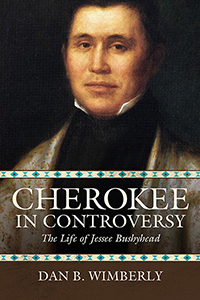 After the journey, Bushyhead was a principal participant in the formation of the new Cherokee government, providing stability in the turbulent and often internecine struggle between factions. And although without legal training, he served the new government as a chief justice of the Cherokee Supreme Court. Yet during these challenges, Bushyhead, also a Baptist minister, assisted missionary Evan Jones in establishing a vibrant Baptist presence among Cherokees. However, some aspects of Bushyhead’s life are more complex. As an interpreter and member of the middle class, he was a key figure in bridging the gap between the white world and Cherokees. But the removal issue divided his tribe and family, resulting in the murders of two close family members. Bushyhead himself received several death threats. Finally, his views on slavery provoked negative responses from abolitionists within Baptist ranks and sparked the separation of denominational lines between North and South.